Scientific papers will be held in English. Each participant will receive a Certificate of attendance, which can be picked-up from the Infostand, starting from May 11, at 10 o’clock. The Congress Infostand will be located at the Grand Hotel Italia in the lobby. For any additional information in regards to the event, please contact the event operator at bapras2019@medevents.ro or fill up the corresponding form from the website. Each participant will receive from the Info Stand the Program Handbook. Program Handbook includes congress and partner materials. Participants are requested to wear their badges at all times while inside the congress center. Internet access will be available by the wireless connection available at the location. Internet password will be available at the Info Stand. 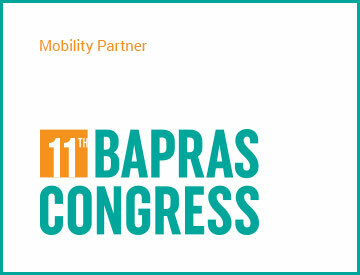 For access in the congress room you will be using the badge which you will receive after registering at the Info Stand. Participants will choose their seats on “first come, first serve” basis. Therefore, we recommend to plan for an early arrival at the premises. There will be accepted for presentation only the digital materials which respect the technical specifications agreed upon registration. The materials need to be dropped at the Info Stand at least 3 hours before the time scheduled for your presentation. Not being able to respect the technical specifications or the time limit could have a negative impact on your presentation. Photography and filming during the symposium are prohibited without written permission from the event Media Coordinator, whom you can contact at the Info Stand. Participants will serve the coffee breaks/lunch in the designated spaces, as detailed in the Program Handbook. The electricity in Romania runs on 230 volts and the frequency is 50 Hz. Plugs have two round pins. A plug adaptor will be required if incompatible electronic devices are used. A wide range of non-prescription drugs are readily available at local pharmacies. For other medication you will need a prescription signed by a registered Romanian doctor. In case of emergency please call the 112 emergency number. The congress operator will not assume responsibility for injury and/or damage involving persons or property during the event. All participants are advised to prevent/avoid any injury/ loss. Lost property can be taken at the Info Stand. To report a lost item please contact the Info Stand. Mobile phones must be switched off during all sessions.